Bored GSD Question - Suggestions? I rescued a 1.5 year old female GSD. Her nature is somewhat laid back but still has a lot of puppy in her. I need additional toys for her when I am gone at school. I already have a kong, two nylon bones, pull rope, and I supervise her when I give her a squeaky toy. What I am looking for is a toy that I don't need to supervise her when I am gone but will still entertain her when she gets bored. Suggestions? 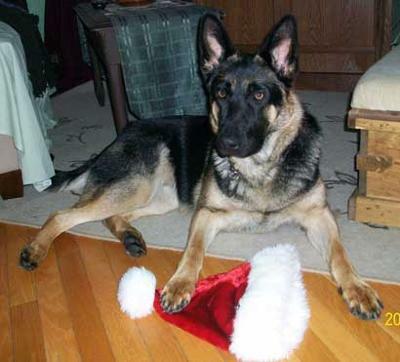 All right everybody, a reader has asked for some help to keep her German Shepherd from getting bored, so let's see what we can all come up with. I'll start things off with one suggestion. First of all I'd have to say, if your dog likes balls at all, my favorite would have to be the jolly ball. We have been giving these to our GSDs for several years now and have never been disappointed. Now let me point out that if your German Shepherds are anything like ours, then make sure you buy the horse sized jolly balls. I think they're about 12 to 14 inches in diameter and they have a handle. They're a lot bigger than you might think the dog would play with but I think they really enjoy the larger size. I did make the mistake of buying a smaller jolly ball once (notice I said once) and the "kids" were not so amused. So now if I can't find the right size jolly ball when shopping for them I wait until my local Tractor Supply gets them in stock. And I'll pass along another tip to you - they come in all different colors and I've bought a few different colors myself - red, light blue, dark blue, green, pink, etc. But my dogs love the dark blue (actually it looks kind of purple-ish to me). In fact, they'll play with the dark blue ones hands down over any other color - even when I give them 2 new ones at the exact same time that are different colors they'll both want the dark blue one! Your dogs might not care about color but mine do so just thought I'd mention it to you. Jolly balls are long lasting and really tough dog toys and can stand up to heavy chewers pretty good. And if they get a hole in them they still keep their shape fairly well (to a point anyway). And my dogs even play with them when they're well past their ball shaped state - in fact our yard is covered with the carcasses of jolly ball past which the kids still enjoy. Kind of a pain having to pick them all up when mowing the yard but otherwise no biggie. So, there's my suggestion - let's see what the rest of you can suggest to keep a German Shepherd from getting bored - house bound or yard bound.